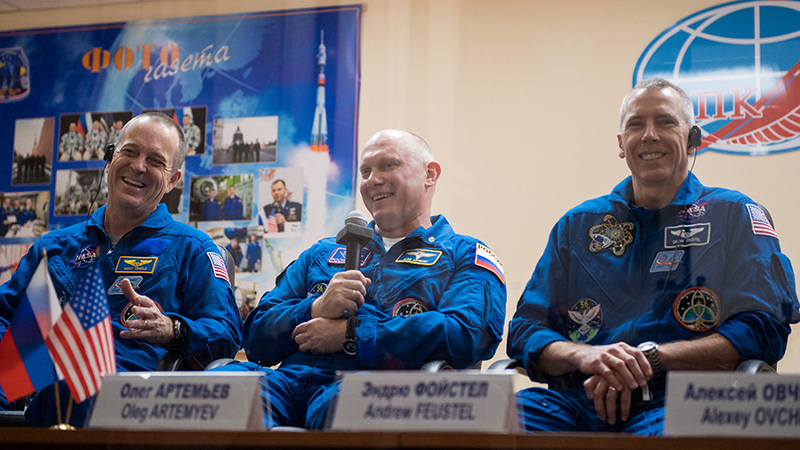 Expedition 55-56 crew members (from left) Ricky Arnold, Oleg Artemyev and Drew Feustel are seen in quarantine, behind glass, during a press conference at the Cosmonaut Hotel in Baikonur, Kazakhstan. A Soyuz rocket stands at its launch pad at the Baikonur Cosmodrome in Kazakhstan ready to blast off Wednesday with three Expedition 55-56 crew members to the International Space Station. In the following two weeks the expanded Expedition 55 crew will conduct a spacewalk and welcome a new SpaceX Dragon cargo craft. Today, NASA astronauts Ricky Arnold and Drew Feustel and cosmonaut Oleg Artemyev held a press conference while in quarantine at the Cosmonaut Hotel talking to journalists behind a glass partition. The trio will blast off inside the Soyuz MS-08 spacecraft Wednesday at 1:44 p.m. EDT for a two-day ride to the station. The experienced space travelers will dock to the orbital laboratory’s Poisk module Friday at 3:41 p.m. NASA TV will begin its live launch coverage at 12:45 p.m.
Feustel and Arnold will then get busy preparing for a March 29 spacewalk while familiarizing themselves with space station operations. Both astronauts are experienced spacewalkers and will work to install wireless antennas on the Tranquility module and replace cameras on the Port-1 truss structure. The spacewalk will be broadcast live on NASA TV and is expected to start at 8:10 a.m. and last about six and a half hours. SpaceX is ramping up for a launch no earlier than April 2 of its Dragon commercial cargo craft to resupply the Expedition 55 crew with new science gear and crew supplies. The crew onboard the station has been configuring the orbital lab to enable the new research such as the Wound Healing and Metabolic Tracking experiments. I like u guys have a safe and successful trip. Remembering all launches from Cape Kennedy Mercury program to present have fun.